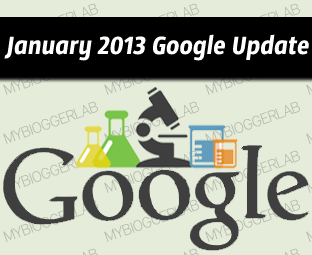 January 2013 Google Algorithm Update Under Progress? A few days ago, lots of users were asking me whether Google has updated their Algorithm. At that time, I was unsure because Google recently pushed out a refresh to their algorithm just 10 days before the New Year. Therefore, it was not the ideal time to roll another one. None the less, there are some rumors going around in the blogosphere about an unofficial either Panda or Penguin update. The matter got fired up when two chatters started a thread on same topic. Both the threads were related on traffic declining. The two threads on WebmasterWorld convinced me that there was an update on January 2013. Still, we are unclear whether it is a Panda, Penguin, or anything else. However, it is for sure that there was some refreshment that Google has made to their Algorithm. All the automated monitoring tools did not displayed anything substantial results. Therefore, we cannot confirm whether it was an update or not. All the foremost automated monitoring tools have updated their statistics to Monday, 14 but still the effect seems to be normal. Consider the following screenshot to see the weather report of Google Algo. 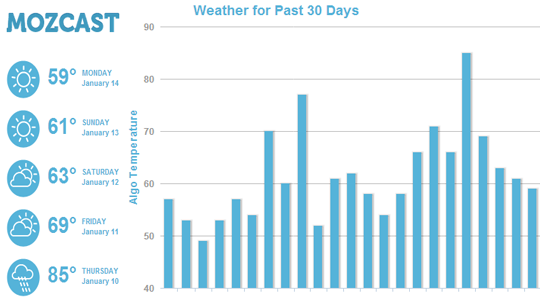 The weather reports show that, it was not an update because we hardly saw any kind of fluctuation in the Metrics. However, it would be something like a small index shift or possibly some fluke in the Google ranking system. Those who were thinking, that there was some kind of update were right in their own perspective because Google never reveals their little secrets in public. They always decline all the rumors by repeating their diplomatic statement. All we can do is to smile at each other’s face thinking what would be the next move by Google. If anyone is unsuccessful in recovering his site from either Panda, penguin then, he should start a new site because there is never too late. Try to focus on the quality of the content, forget about the quantity because those days were down and dusted when we use to write long tail articles. Now here people might argue that we have Reconsideration request to recover from Algorithms but rightly one cannot recover it fully. Yes, it would start receiving some traffic, but the quality of traffic would be at the lower side. Now the decision is all yours Take it or leave it. Does anyone saw a fluctuation in their Traffic or Ranking? I thought the same thing, my traffic when down as well but soon retuned. @Syed Is there any update confirmation ?